Powerful muscles bulge under a mangy hide as two bears lumber about sniffing the air with a nose that can distinguish smells up to three miles away; this sense being seven times stronger than bloodhounds. Glassy dark eyes turn towards me in nonchalance, used to being the main attraction for curious humans. My husband Rick and I stand riveted watching these magnificent animals at the Grizzly and Wolf Discovery Centre in the town of West Yellowstone. 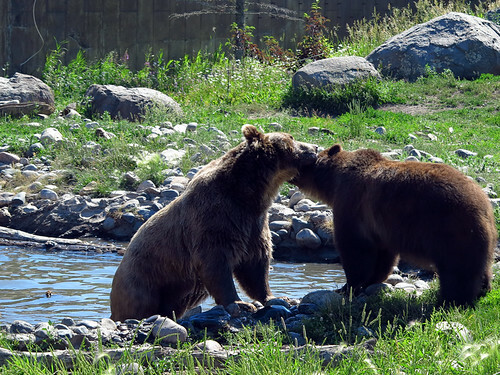 A total of nine grizzlies (ursus arctos horribilis) live here, but since they don’t all get along with each other, the facility’s bear-keepers incorporate a turn-taking system in the viewing area. 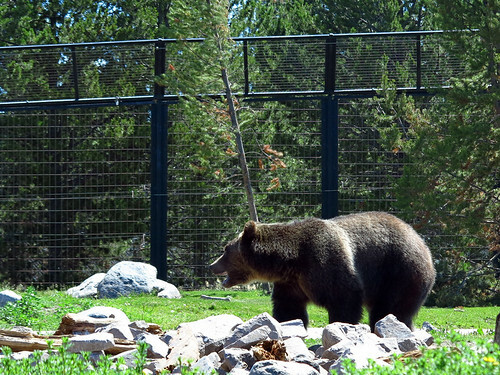 Each bear has a name and a story of how they came to be residents at this wildlife park and educational facility. Today it is Sam and Illie who are zeroing in on the stashes of food previously hidden by the staff. Dust flies off Sam’s dense brown coat as he initiates a wrestling match with his sister…or tries to. Illie’s rolling-thunder growl changes Sam’s mind. In 1996 these twin sibling cubs wandered into a fishing village in Alaska after the disappearance of their mom. They were hand-fed by the villagers, but there came a time when their size became a threat. Sam now weighs in at 1000lbs (455kg) and lady Illie at 800lbs (363kg). Being Alaskan Grizzlies (a.k.a. Kodiak Grizzlies) they outweigh the Yellowstone Grizzlies which as adults normally tip the scales at between 400 and 500lbs. This duos exiting over a small hill is our cue to move on also. Expecting only stuffed wolves and information charts, I am thrilled the centre is home to two packs of Grey Wolves (Canis lupus)! Hurrying over to one of the wolf enclosures we scan the grass and find several unmoving heaps of fur, some grey as in their name, others in shades of browns. I am determined to wait out the pack’s naptime. My breath catches as the wolf nearest us stands and shakes his rich grey coat. 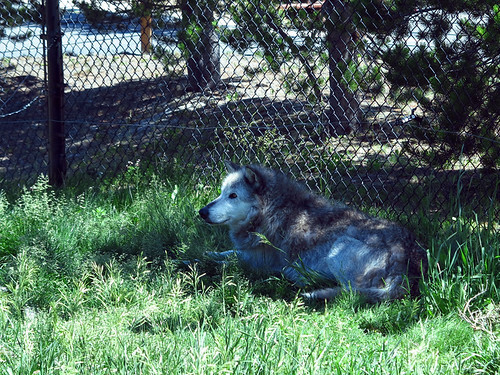 He is Kootenai, the Alpha Male of this pack. I am stunned by his great size. He stares us down with attitude, then purposefully leaves his sunny spot on the top of the knoll and saunters off to a shady niche next to a large rock. There he promptly stretches out and closes his eyes. “Well, I think that’s the only activity we’ll see here for a while,” Rick convinces me. As we leave the sleeping wolves I imagine their life in the wild. It’s time to see the raptors, such as an eagle and falcon, plus some other winged species that complete the residents of the centre. Each of the creatures here has been rescued from abandonment or life-threatening injury, or for some other reason is deemed not able to survive in the wild. My eyes become glued to the centre of the mound as it starts to sputter and belch small amounts of steam. Suddenly a gigantic whoosh – a plume of scalding water and steam spews upward, followed by another and another powerful spray before the geyser is spent…for now. “Wow, that’s a worthy opening act!” I say as we jump back in our vehicle to move on to the next site. This enormous park spans an area of 3,472 square miles (8,983 sq km). It is primarily in Wyoming but extends into Montana and Idaho. 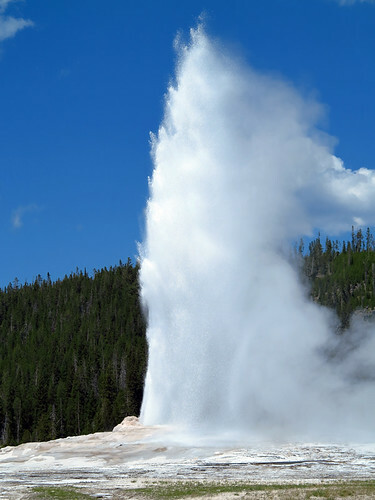 Yellowstone boasts the most thermal activity in the world in geysers, hot springs, fumaroles, and mudpots. We visit basins with such names as Biscuit, Midway, and Black Sand. At each location the run-off channels are ablaze in oranges, brown and reds from thick mats of heat-loving microorganisms called Thermophiles. These mat communities function like a forest, with the top using the sun’s energy to fuel the system and the organisms below using the chemicals produced by the higher-ups – a whole ecosystem within a depth of a few inches. Some of the basins in the park sport glimmering emerald and sapphire pools of water. We take in as many basins as we can until our wobbly legs and growling stomachs rebel – and we call it a day. The next morning we enter from the park’s north entrance for its proximity to Mammoth Hot Springs at an elevation of 6,239ft (1,900m). The huge hot springs area is made up of lower and upper terraces. We follow the route that park rangers at the Visitor Centre predict will to be the most active today. Our jaws drop in amazement as we move between the lower level terraces. 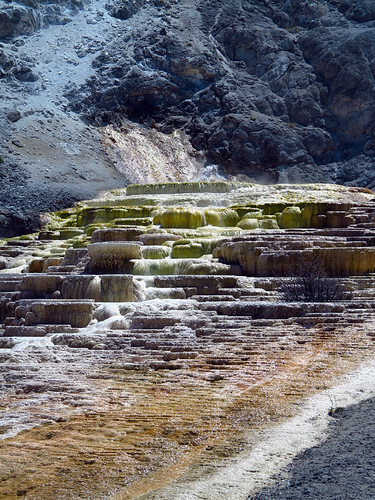 They are fashioned by volumes of piping hot water bringing up dissolved calcium carbonate that spills over at the surface in the form of travertine, a limestone compound. The terraces are constantly changing their shape like living sculptures! Thermophiles in brilliant orange, rusty browns, mustard yellows cling like tight-fitting multi-coloured tapestries down the sides. From the lower terraces we climb a multitude of steps to yet another spectacular series of terraces. Canary Spring is as yellow as the wee bird. Angel Terrace is so startling white it is blinding in the sunlight. On the hills above the Hot Springs 500 year-old pines reach into the azure sky. We leave in awe of this incredible display of nature’s artistry! We started our Yellowstone adventure on a grizzly note, so figure we may as well end on one. On our way back from Mammoth Hot Springs we stop at Montana Grizzly Encounter. Once again, all the bears here have been rescued from harmful conditions or born in captivity wherein release back into the wild would equate to their sure death. Of the five bears that make this their home, we have the privilege of seeing three. What’s truly great about this rescue and educational sanctuary is as we ogle the bears from a well-appointed viewing deck (chairs optional) Ranger Bill using a microphone (yeah, everyone can hear!) enlightens us on grizzly behavior. Again food- hide-and-seek entices the bears down into the viewing arena. The first bears out are a hefty 900lb Alaskan Grizzly named Brutus, and a smaller Montana grizzly, Sheena. There’s no doubt Sheena is boss when she and Brutus are vying for the same food cache. Her ladyship then decides to take a splash in a ditch-like pool of water, which we envy being that it is 86 degrees F (30 degrees C). After her dip Sheena meanders out of the enclosure. Brutus watches as the youngest bear Lucy bounces in at 300 lbs (136 kg). Now two years of age she has come a long way since she was found abandoned when she was five months old, weighting a mere 12 pounds (5.4kg). All the bears here are patient with this young’un. Brutus engages Lucy in some rough and tumble fun. While these antics are going on Ranger Bill imparts facts that will forever be imbedded in my mind, “A fed bear is a dead bear. Once a wild bear tastes human food, they are spoiled for life, and it may mean they have to be done away with as even if they are taken far away from human settlements they keep coming back.” Bill continues with valuable information on the do’s and don’ts of meeting a bear in the wild. We get a chance to bare our souls with bear questions. Brandon, another ranger, is on hand in a booth to sell bear souvenirs ($ goes towards bear-care in this non-profit centre), snacks and thirst-quenching drinks. 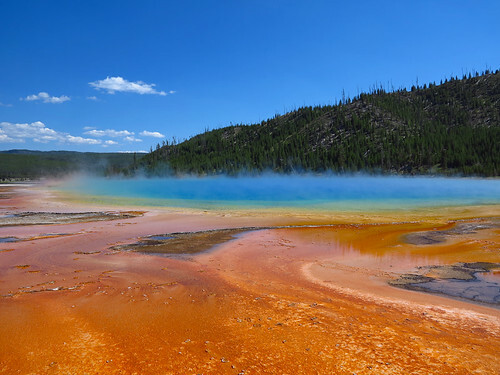 Yellowstone National Park has been on our list of “must see” places for many years. It is more spectacular than we could ever have imagined! The grizzly encounters were great. Our only regret – not enough time to see more – but this also leaves us planning another visit in the future. Travel Tip: Check out distances vs time. It is a given with the size of Yellowstone National Park and the curvy roads within the park that moving from site-to-site is slow. BUT what you can do is lessen the time to get to the Park entrances by choosing an accommodation as close as possible to these entrances. The town of West Yellowstone is handy to the West Entrance of the park, and Gardiner to the North Entrance. Our hotel was in Boseman, a fine community – but it added hours of driving to get back and forth to park entrances. Last time I was in Yellowstone was early May in 1981. Snow was still around and the weather unpredictable. I adored it and want to return after reading this great post and seeing Rick’s gorgeous images. Thanks Julie! There will be a next time for us someday as there was still so much to see.